Why are traders so obsessed with the upsides of a Trump presidency when the downside risks seem just as big? For all his pro-business promises, the former reality TV star’s confrontational foreign policy and haphazard management style have bred uncertainty — the one thing investors are supposed to hate most. On one hand, the VIX index, a popular gauge of anxiety in the U.S. stock market, has dropped more than 30 percent since Trump’s election. 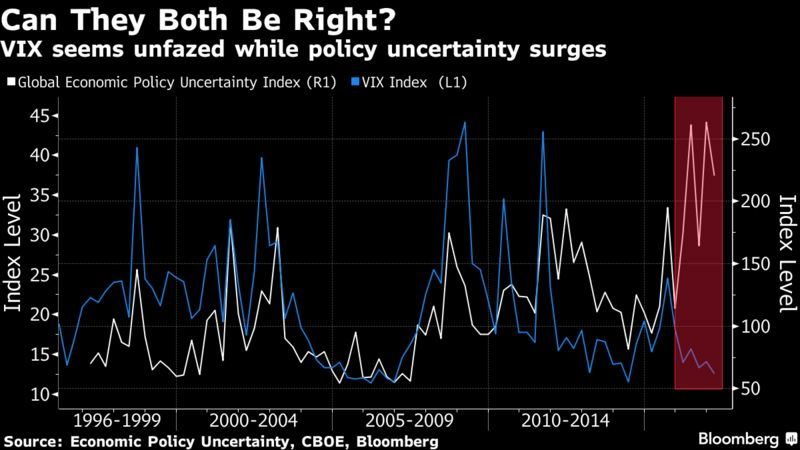 While on the other hand, the most worrying chart we know” by Societe Generale SA at the end of last year shows a surging index of global economic policy uncertainty severing its historical link with credit spreads, which have declined in recent months along with other measures of investor fear. “I don’t generally call the entire market wrong — investors are very smart, highly motivated individuals — but I find it hard to say why stock markets are so un-volatile right now,’’ says Nicholas Bloom, a Stanford University economist who co-designed the uncertainty gauge with colleagues from the University of Chicago and Northwestern University. 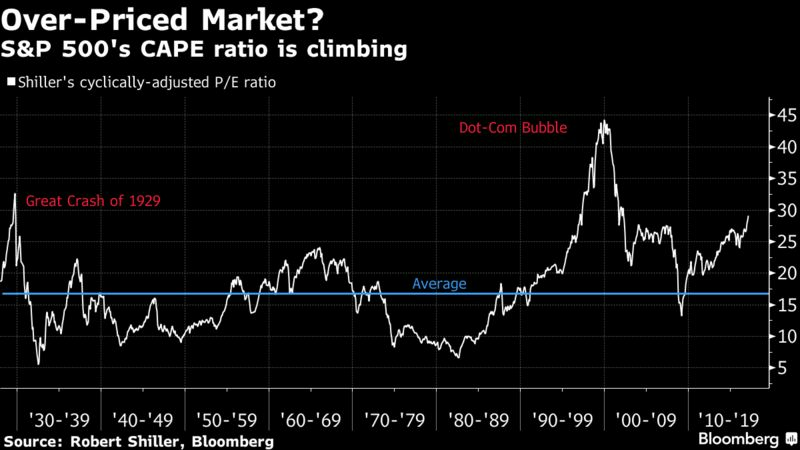 One factor that makes Shiller cautious on American shares is the S&P 500’s cyclically-adjusted price-earnings ratio: While the metric is still about 30 percent below its high in 2000, it shows stocks are almost as expensive now as they were on the eve of the 1929 crash. Robert Shiller did not forecast a short-term decline in stocks, but told Bloomberg that he wasn’t buying more. The benchmark S&P 500 index has gained 11% since the election. While a five-quarter streak of year-on-year earnings declines ended in the fourth quarter, the market was also propelled by expectations for tax cuts and deregulation. As there hasn’t yet been much implementation, several strategists have argued that stocks are due for a pullback that won’t necessarily end the eight-year-old bull market.